Audi's lineup has no shortage of performance, with various S and RS cars, but it lacked a high-performance coupe — until now. 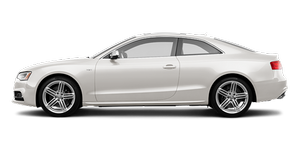 The S5 is based on the automaker's new A5 coupe and brings a full serving of power and style to the performance-coupe corner of the market. The S5 mostly delivers on the concept of performance in a two-door package, but overly isolated steering prevents the coupe from being the runaway winner it otherwise would be.